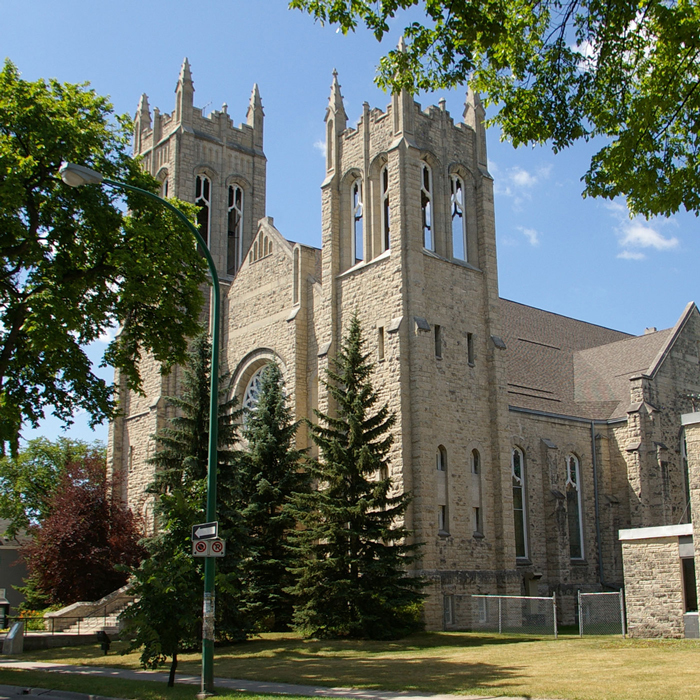 Westminster United Church offers a large, inspiring venue, the design of which is based on an interpretation of the Gothic Revival, a popular architectural style that drew its inspiration from medieval churches. Our architecture emphasizes pinnacle towers, slender vertical supports and large openings, and a beautiful rose stained-glass window. Westminster is an ideal venue for concerts, grad exercises, and recording sessions, as well as weddings and funerals. The church is well served by public transit. On-street parking is available nearby, along with commercial parking at Misericordia Hospital Parkade (a short walk from the church). A side entrance on Westminster Avenue has wheelchair access, which serves the main floor of the building and two wheelchair-access washrooms. The Sanctuary features main floor and balcony seating for over 900, a large choir loft, a Casavant Freres pipe organ, a 7’6″ Yamaha piano, hardwood floors and carpet aisle runners. The acoustics are among the best in the city. A sound system is also available. The large new platform with special lighting works for orchestras, choirs, solo recitals, grad ceremonies, and concerts and performances of many different kinds. The Lecture Hall can accommodate 100 people for a reception or 50 people for a rehearsal or a meeting. Rectangular tables and chairs are available for set-up. The Chapel accommodates 50 people for services (with an Allen Organ) or 30 people for standing receptions or smaller groups for meetings. The floor is carpeted and the movable chairs are upholstered. A small kitchen, with electrical outlets, fridge and sink, can be accessed from the Chapel. The Library can be used for meetings and for small rehearsal space. The room accommodates 25 at a meeting. Rectangular tables are available for set-up. A small kitchen next to the Chapel can be accessed from the Library. The Concert Hall, accessed from the rear of the building and up a flight of stairs, is a large space and can accommodate up to 250 people at a standing reception. Rectangular tables and chairs are available for set-up. A small kitchen, with electrical outlets, fridge and sink, can be accessed from the Concert Hall. There is also a small lounge area adjacent to the main hall area. For more info on renting Westminster Church for your event, please contact the office administrator.